Measuring only 3.22" x 3.14" x 3", the RL-15-LED-CPR from Larson Electronics is an ultra compact portable floodlight that contains five 3 watt high output LEDs that generate 1,100 lumens of cool white light while drawing 15 watts of energy. This lightweight floodlight includes a carrying handle, a rechargeable 3.7V/3600mA lithium battery, and a magnetic base for for quick and easy on-the-go mounting. A uniquely designed articulated light head allows for front to back adjustment over a 180° range. This light is impact and vibration resistant, dustproof, rustproof, and rated IP67 waterproof, making it ideal for the rough conditions encountered in hiking, camping, hunting, and outdoor work areas. 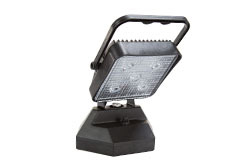 Whether used for recreation or work (or a little of both), the RL-15-LED-CPR compact floodlight simply can`t be beat. 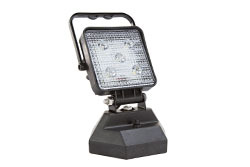 Light Features: Don`t let its small size fool you - the RL-15-LED-CPR portable floodlight is a compact powerhouse built to withstand demanding outdoor conditions and rugged use. This floodlight contains five 3 watt LEDs that generate a total of 1,100 lumens of cool white light while drawing a total of 15 watts of energy. With a 6000K color temperature, this light provides superior color rendering and contrasting properties. Objects are clearly and sharply illuminated throughout the reach of the flood beam. The LED assembly is protected by a rustproof die-cast aluminum housing and an impact and shatter resistant polycarbonate lens. Weather resistant, dustproof and IP67 rated waterproof, the RL-15 can be used in rough and wet outdoor conditions, including in the rain. Additionally, the RL-15-LED-CPR features an articulated light head that can be manually adjusted through a 180° front to back range of motion. 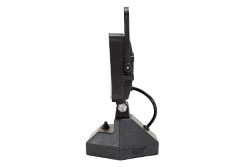 The operator simply pushes the light head to the position desired using fingertips. Once adjusted, the light head will stay in place while held/carried by the handle or mounted using the magnetic base. 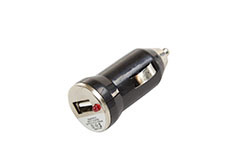 An easy to reach sealed power button is located on the base of the unit. To turn the lamp on, the operator presses the button once, and another press turns the unit off. 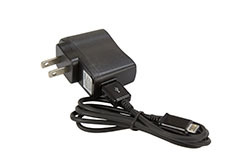 Power/Wiring/Plug:The Rl-15-LED-CPR portable floodlight contains one rechargeable 3.7V/3600mA lithium battery that is charged via an included USB cable, making it a cinch to charge at any location using a computer, vehicle USB adaptor, or a wall USB charger. It has a 4.5 hour run time on a single charge. 6. 100lb grip magnetic base. 9. 1,100 Lumen output from only 15 watts.